Breathtaking. That’s probably the best word to sum up Sicario, if I had to choose one. The film had me in its grip from beginning to end, closing in tighter with each pulsing beat. Sicario is about idealistic FBI agent Kate Macer (Emily Blunt), who is recruited to join a covert government task force looking to curtail the drug war that rages around the Mexican–U.S. border. It’s also about cultures in crisis, and an increasingly violent world that’s showing signs of growing numb to death and destruction, and that believes more and more that the end justifies the means. The film begins by explaining the origins of its title: sicarii was the name given to zealots in ancient Jerusalem who fought off the Roman invaders to protect their homeland; in Mexico, sicario means hitman. That introductory text is the first heavy hit the film delivers—along with its unnerving score. Right away, Sicario makes it clear that it intends to throw open the box full of questions, each of which has no clear answer. Which land is the homeland? How can we truly tell the invaders from the protectors? With Sicario, director Denis Villeneuve revisits some of the territory he explored in Prisoners: How far should one go in pursuit of justice or revenge? Is it okay to take the law into your own hands if the truth is tangled up in red tape? And when is violence acceptable? Where is the line that separates victim from perpetrator? The questions keep coming. From what I can tell, to Villeneuve, violence is only acceptable when it exposes the damage done; never when it’s presented as entertainment. In the film’s opening sequence, Kate and her partner, Reggie Wayne (Daniel Kaluuya), lead a deadly raid on a house in Phoenix, Arizona. They’re looking for hostages, but instead they find corpses stacked vertically between the walls—plaster tombstones sealed by bleak paint jobs. Even after Kate flees the house, standing in its backyard of dust as she and her team reel from the discovery, we’re not safe from what stands inside. Villeneuve takes us back to glimpse ever closer at the faces of those who fell victim to the drug cartels. The directorial choices that make the opening sequence, and all the rest, so impactful are why Sicario left me breathless. It showcases some of the best filmmaking talents working today, led first and foremost by its profoundly gifted and ruminative director. Aside from Villeneuve, the person who might be most responsible for the film’s chest-clenching effect is composer Jóhann Jóhannsson, who delivers a stunning score full of cello, percussion and electronics. His music haunts the movie, snaking and rattling through scenes as it makes its way from simmering to seething. Lighting master Roger Deakins pulls off extraordinary feats of cinematography, particularly in low-light settings (including one incredible sequence in a tunnel, shot using night vision and thermal-image cameras). Taylor Sheridan’s script is brilliant (amazingly, Sicario is his debut screenplay). In the lead roles, Blunt, Del Toro and Brolin are excellent, each as skilled as they are talented. Editor Joe Walker pulls it all together, making for taut, tightly wound coil of film that threatens to snap off the spool at nearly every frame. Those are some of the headline names associated with Sicario. But as with any film of this scale, there are of course many more artists who played a critical hand in making it happen. One of those people is storyboard artist (and Kickass Canadian) Sam Hudecki. Sicario is Sam’s third collaboration with Villeneuve, after Enemy and Prisoners (and before next year’s Story of Your Life and their current collaboration, the Blade Runner sequel). I worked with Sam many years ago, after we graduated from Queen’s University’s film program, when he was 1st assistant camera on my short movie Sight Lines. He’s now in the midst of a pretty thrilling project, but he graciously made time to chat with me for this review and share his behind-the-scenes insights. There’s another sequence in the film that stands out to me, one that’s equally impactful. After the special ops team travels to Juarez to capture one of the top players in the Mexican cartel, they bring him back for “questioning” at the hands of Alejandro. Alejandro sidles down the hall and into the interrogation room, whistling all the while, toting a jug of water. When he approaches the captive, Alejandro doesn’t strike him; instead, he saunters up so close to him that the looming attack starts to feel almost intimate. It’s one of the most intimidating moments I’ve seen in a film. Mercifully for the viewer, if not the captive, the violence takes place off-screen. We don’t need to witness it; Alejandro’s quiet menace bares all. He does it again with Sicario, which strongly emphasizes Kate’s point of view in a male-dominated world. So it’s somewhat shocking (from an artistic perspective, if not a business one) to learn that backers who initially looked at the film wanted Kate replaced with a male protagonist. To make the lead character a man would completely change the story. It would be to lose Kate’s inherent vulnerability, the eyes through which we see the story—those of an outsider. Fortunately, with Villeneuve involved, there was no need. According to Sam, “Denis brought a lot of attention and sensitivity” to Kate, something Sam himself appreciated. 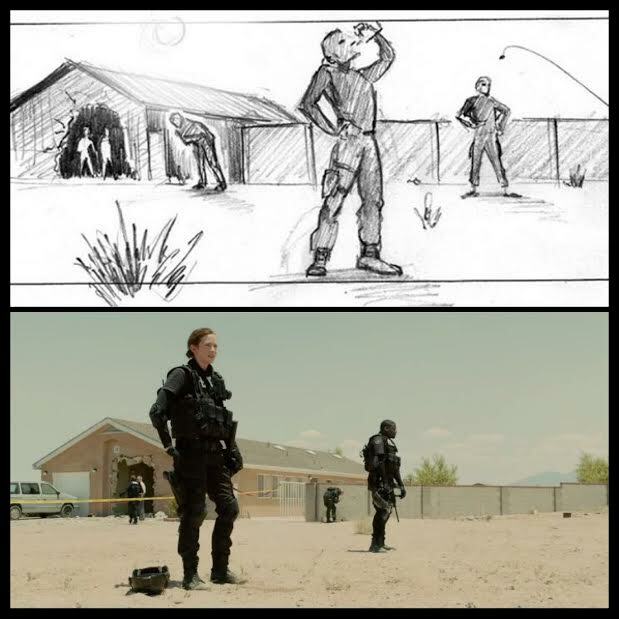 Adopting an outsider’s perspective was a key factor for Sicario, given that the crew couldn’t film in Juarez, where many key scenes were set. We see it only from a distance, which is fitting given that our impressions of the city are framed by someone who doesn’t truly understand what she’s being drawn into. “You only get to know a hint of what’s really going on there, and that’s as far as we could take it,” says Sam. The subject matter isn’t surprising when you consider the source; Villeneuve has become known for his penchant for exploring the darker side of humanity. But that doesn’t mean the director himself is mired in gloom. “I read somewhere that people (assume) he must be a very dark and depressed person,” says Sam. “It’s not true; it’s actually quite hilarious and tremendously enjoyable to work with him. I’m still catching my breath. Keep an eye out for the next two collaborations from Sam and Villeneuve, two of Canada’s greatest film talents—Story of Your Life, set to release in early 2016, and the Blade Runner sequel, scheduled to start shooting in summer 2016. Dropped off the edge again down in Juarez |“Don’t even bat an eye | if the eagle cries,” the Rasta man says, just cause the desert likes | young girls flesh and | no angel came.